One of the most tantalizing abilities of human nature when facing a “what’s that for?” question, is to interfere in a system and check the downstream effects of this change. This empirical approach has set the basis of our global understanding of nature along history. Research is no different: functional study of biological systems is based on over-stimulating or inhibiting components and observing downstream consequences. For any cell biologist, the target to be altered is the cell. The way to do this is by using molecules able to get through the membrane and produce an alteration (inhibition or stimulation) of the biochemistry inside. However, the plasmic membrane is designed to protect the cell from external “non-authorized intrusions” with very effective systems for this task. Therefore, how to efficiently deliver exogenous nucleic acids inside the cell? 1- Foreign RNA/DNA molecules can be “disguised” with a chemical functionalization that makes them look like “authorized passengers” into the cell. Biodegradable Cationic Polymers (BCPs) and mimicks of virus nuclear targeting peptides (VIPs), once chemically attached to nucleic acids, can lead this exogenous material to passively cross the plasmic membrane. Alternatively, chemical adjunction of nanobeads to polynucleotides can lead to their active internallization either through endocystosis or the biolistic (gene gun) technique. 2- Sophistically adapted by several thousand years of evolution, viral systems survived because they solved the “no entrance” cellular defenses. The most widely used are Adeno-Assotiated Viruses (AAV) for in vivo expression of foreign sequences and lentiviral particles, showing a high efficiency for in vitro purposes (near 100% infection). Genetic engineering of their genomes provide space to accommodate exogenous sequences of interest, while depriving them of most of their harmful properties. 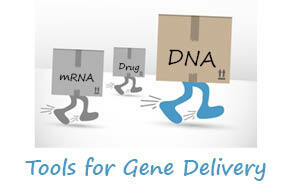 The combination of VIPs and BCPs is a good starting strategy for DNA/RNA delivery to an increasing list of cell lines. VIP derived from viruses, preferably targeting a given cell type, can significantly boost the yield of passive transfection for their cognate cell type. Scientists can now access improved cell specific transfection reagents (ex. SignaGen GenJet Plus) showing high transfection yields, from 70-90%) based on this VIP/BCP technology. Other strategies involve the use of nanoparticles (functionalized for their covalent adjuntion to polynucleotides) to deliver DNA/RNA or siRNA into the cells (biolistic or endocytosis): it is a non-toxic way of delivering molecules and several exogenous sequences can be combined in the same experiment. The incredible efficiency of viruses in infecting (entering) a cell was meant to provoke the afore-mentioned “Human nature”. For the purpose of finding a way around the banned importation of exogenous sequences inside a cell, genetic engineering is now able to remove harmful traits of a virus, impairing its self-replication (infection without propagation). This not only allows safe manipulation in the lab, but providentially provides at the same time a large extra space in the genome. Exognenous nucleic sequences of interest can now piggy-back on dompted viruses and efficiently find their way to the inside of the cell once prohibited. Lentiviruses have the hability to infect non-dividing cells (this feature is specific of this type of virus among retroviridae) and they are adapted to deliver a large amount of RNA into the target cells. The most updated version of lentiviral systems is the 3rd generation of lentiviral systems (HIV and FIV). In their latest evolution, these lentiviruses of “improved safety”, are defective for both replication and packaging. This way, if a viral production is required, the replicative elements must be provided by the host cell line (usually 293T) upon transfection with dedicated vectors bearing the packaging elements of the virus. Lentiviral expression vectors (ORF with N-or-C terminal fusion tag or un-tagged or shRNAs for silencing) consist of sequence elements allowing efficient transduction and stable integration into genomic DNA of target cells and thus enabling high levels of expression and detection of ORF insert in host cells. Adenoviruses are naked viruses (no envelop) with dsDNA genome. The genes of Adenoviruses are classified in two types: early stage: E1, E2, E3 and E4 and late stage: L1, L2, L3, L4 and L5. The most used adenovirus for gene delivery is the Type 5 recombinant Adenovirus, where the E1 and E3 genes are deleted (leaving room to integrate 7-8 kb of foreign DNA in the viral genome). For Adenoviral production, the line 293T must bear both E1 and E3 genes. Once produced in vitro, these viruses are able of infect most mammalian cells and have a high transduction efficiency, that makes them a very adapted tool for high expression studies. They are maintained episomally at any stage of the cell cycle (growing or quiescent) and there is no integration in the host’s genome, so they comply with the requirements of short term studies. However, they are not easy to produce (as opposed to lentiviral particles) even if they show 100% of gene delivery when dosed adequately. Solutions do exist for researchers seeking to have these produced. How do you deliver exogenous nucleic acids inside your cells of interest? Leave your comments below!